This Crispy Fried Halloumi recipe has been shared in memory of Isabella, Coriander Queen. People blog for all sorts of different reasons. I started mine back in April 2011. It was the Easter holiday and I was back at my parents house taking some much needed down time from studying at university. I was also having a bit of a pants time and wasn’t getting on so well with the girls I lived with. We’d kind of drifted apart not least because they were more interested in going clubbing then hanging out down the university allotment with a batch of home brew. By starting the blog I was hoping to seek out like minded people. When I started writing and sharing my creations it definitely felt like I was talking to a brick wall. But as the visitors started to increase (and some even left comments) I realised there was a community of foodies out there who all wanted to connect. 6 years later (almost to the day) I’m now part of a huge food blogging phenomenon. People are often surprised to hear that I speak to my food blogger friends almost every single day. We not only share our trials and tribulations in the kitchen but stuff that’s worrying us at work or at home. They are a fantastic support network and I never could have imagined how close I would become to people sat behind another computer screen, some hundreds of miles away. That’s why when we heard the news that the Isabella of Coriander Queen had tragically passed away, I was deeply sad. She had become a close friend to so many and was an asset to our community. She was kind and funny, and will be remembered fondly by so many of us. That’s why, a group of us have decided that in memory of Isabella we will each re-create one of the recipes from her site. If you want to see the recipes shared by the other bloggers scroll down to the end of this post where you can find everyone taking part. But, please do also make sure you check out the Coriander Queen blog. Her photos were stunning, and her writing heart warming and witty! She will definitely be missed. Trying to pick a favourite recipe from Coriander Queen wasn’t an easy task. Isabella’s recipes were always delicious morsels and so I knew I’d like every one that I tried. But, when I stumbled across this cracking joke I couldn’t help but smile and I knew this recipe was the one. What did the cheese say when it looked at its reflection in the mirror? Hallou – mi! I told you she had a great sense of humour! Isabella loved “squeaky cheese” because it is so versitile. She rightly points out that you can grill it, kebab it, add it to salads, or fry it as we have done in this recipe. We often have our fried halloumi as part of a meze with tabbouleh, three bean salad and baba ghanoush but this week we popped it in wraps with lots of rich and creamy avocado, fresh spinach leaves, cherry tomatoes and a healthy drizzle of tahini. Though, you could of course enjoy this with a drizzle of honey and a big glass of wine as Isabella suggested in her original post. Because halloumi cheese is so salty, however you serve it, I’d stick to something sweet or creamy to help balance the flavours. Unfortunately as tasty as this recipe is it is also very messy! You could probably avoid using your hands and do it all with spoons and spatulas but that’s less fun. Anyway, enough about my sticky fingers, it’s time for the recipe. Cut your halloumi into slices roughly 1cm thick. Pour the flour onto a plate, add the halloumi slices and toss until well coated. 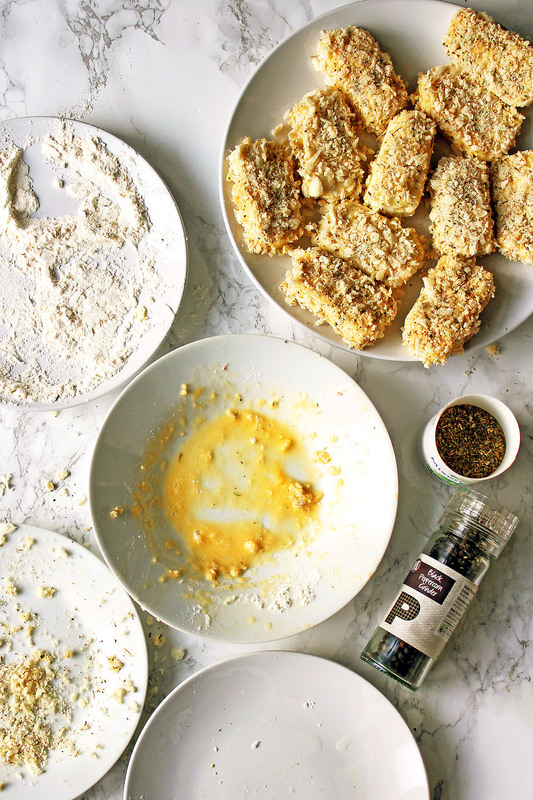 Tip the panko breadcrumbs onto another plate and mix with the dried herbs and the black pepper. Whisk the egg well and pour into a shallow dish. Add the floured halloumi a slice at a time and coat with the egg before immediately placing into the panko breadcrumb mixture. Place each pank crumb coated halloumi slice on to a clean plate until ready to fry. Pour the oil into a small frying pan and heat on a medium heat. Test the oil by adding a crust of bread, if it froths and bubbles and the bread turns golden in 30 secs it is ready. Add the slices of halloumi, frying them in small batches of two or three at a time. Fry for about 30 seconds to 1 minute on each side, or until golden brown and the breadcrumbs are crisp. Place some kitchen roll onto a plate, and using a slotted spoon or fish slice gently lift out the fried cheese slices and place on the kitchen roll to drain off some of the oil. Serve as soon as all the cheese has been fried. These slices of crispy fried halloumi are seriously moreish. I made more than enough that we needed for dinner and found myself “testing” a few straight out of the pan, desperately trying to put out the fire on my tounge with a glass of white wine I’m sure Isabella would have loved. Across social media I’ve had lots of requests for where you can buy the colourful plates in my photos. Head over to Amazon and you’ll find a couple of different plate designs and all different sizes ! Whether you’re a fellow food blogger or have stumbled here by chance, please do support the food blogging community and Isabella’s memory by checking out some of the other recipes below. Looks delicious, I don’t make halloumi often enough. This is a lovely tribute to Isabella! Thanks Margot – weve made this 3 times now since the sad news. Its fab! There are few groups of friends I talk to as often as our little community. Lovely post, we will miss her. Lovely post and what a delicious recipe you picked. I think I might have to get messy with some hallou – mi! 🙂 you make me smile! We made this again tonight. Well worth the sticky fingers! The Halloumi looks delicious and really crispy. Beautiful Tribute. They were weren’t they! I know its been for sad reasons but its been heartwarming seeing everone come together in memory of Izzie and sharing all of her wonderful recipes! Thanks Ceri. She had a fantastic sense of humour!!! I love that you found a post with a joke! We do have a lot of fun with our blogging friends, it’s a great community and a little poorer for the loss of Izzie. I don’t often cook with halloumi, but I do fancy trying this recipe if I can face the mess! Love Isabella’s joke and so pleased you didn’t fry your fingers. These crispy fried halloumi look gorgeous, another recipe I must try! YUm!!! This looks amazing. Fried halloumi?? I am there!! So sad, but lovely that you are paying such a nice tribute with this mouthwatering recipe. And when I say mouthwatering, I am not exaggerating when I say I am drooling over the keyboard. The Greek culture has something similar that I just love, it’s feta cheese wrapped in phyllo, baked then drizzled with honey and sesame seeds. Your Halloumi looks just as delicious and might make a good switch-up to my usual Greek Baked Feta appetizer! I’m sure that every time that you make this delicious recipe, you will think of her! Lovely.